I should have known that this DEAD DAISIES show at The Forge, an exemplary indoor concert venue and club in the south Chicago suburbs, would be one of the best authentic rock shows in the Chicagoland all year thus far. After all, ever since its 2012 founding by David Lowy, THE DEAD DAISIES has featured a "collective" of musicians with impeccable pedigrees and credentials - alums from such bands and rock royalty as WHITESNAKE, DIO, THIN LIZZY, JOURNEY, MOTLEY CRUE, and GUNS 'N ROSES. But, despite the formidable resumes of its members, the current line up of the collective (Doug Aldrich - lead guitar, Marco Mendoza - bass, John Corabi - vocals, Deen Castronovo - drums, and founder Lowy - rhythm guitar) is still jaw-dropping with its brand of authentic and infectious enthusiasm in their live performance to the degree that you would expect of first album prodigies and go-getters. 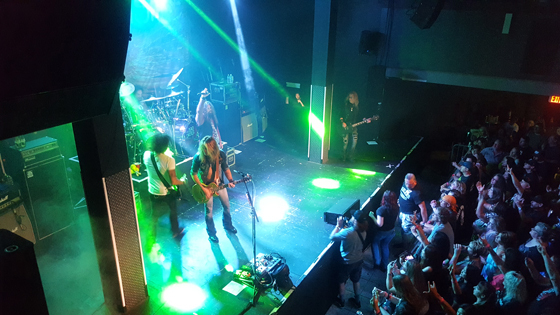 Additionally, The Forge, like many venues on the current tour, presented a rare opportunity to see THE DEAD DAISIES, a truly premier rock band, in an intimate and up close setting, and which also included the band's stunning sound and lighting system for good measure. It is a must-see opportunity, especially when it also includes openers Dizzy Reed's HOOKERS & BLOW (which also presented a high caliber set, with several GUNS 'N ROSES tunes included) and local Chicagoland new age classic rockers, TEEZE.